Well, I definitely enjoyed my two days in Istanbul more this time than I did back in my last visit in 2009. Having three friends to laugh with definitely helps. 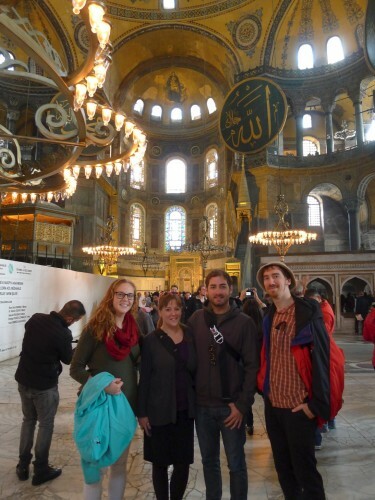 The Turkish people I interacted with on the street were still a bit sarcastic and dry but it didn’t bother me as much as it did when I came from Jordan, and I think I realized why – Jordanian people are almost always warm, welcoming, and more “Midwestern” in their friendliness. Turkish people can be a little bit more dry and British/New Yorker-ish – which some people who aren’t from Wisconsin might even find preferable to the kind of always-smiling politeness of Jordan. It seems more genuine to some. 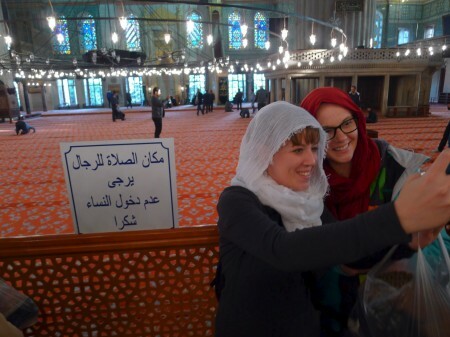 Back in 2009, coming straight from Jordan and alone, I think I probably expected the Turks to act the same way – but they didn’t, so I felt rubbed the wrong way. 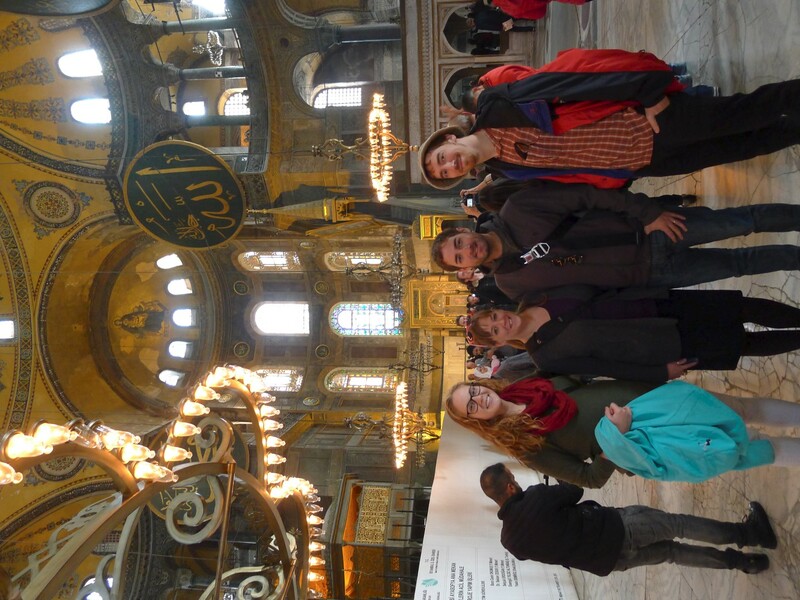 We saw the Hagia Sophia and Sultanahmet, and they were just as pretty as last time. One of the six minarets on the Sultanhamet was missing; appearing to be under rebuilding construction. I went back and consulted my photos from six years ago; sure enough, that one definitely looked the most dilapidated and ready to fall over. Hagia Sophia had had massive amounts of scaffolding inside of it, which unfortunately covered up some of the six “seals” of the important Islamic names. We paid a tour guide named Salah-ad-Deen to let us skip the line and lead us about, similar to what I paid for last time. I didn’t really remember the last time, so it was all good! It was worth the 100 lira for his guide services (about 34 dollars; the exchange rate is currently about 2.8 lira to the USD) to skip the half hour line. The two new monuments I got to see on my trip were the Basilica Cistern and the Suliemanye Mosque and Cami. 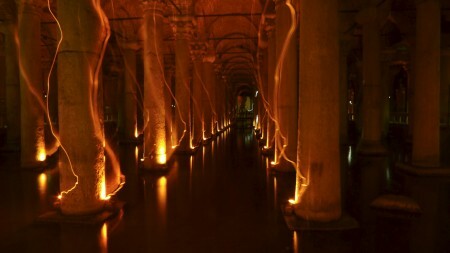 The former was only 100 meters away from the Hagia Sophia; for 20 lira each we got to go underground into this massive cistern, filled with stone columns that were lit from below with beautiful warm red lights. 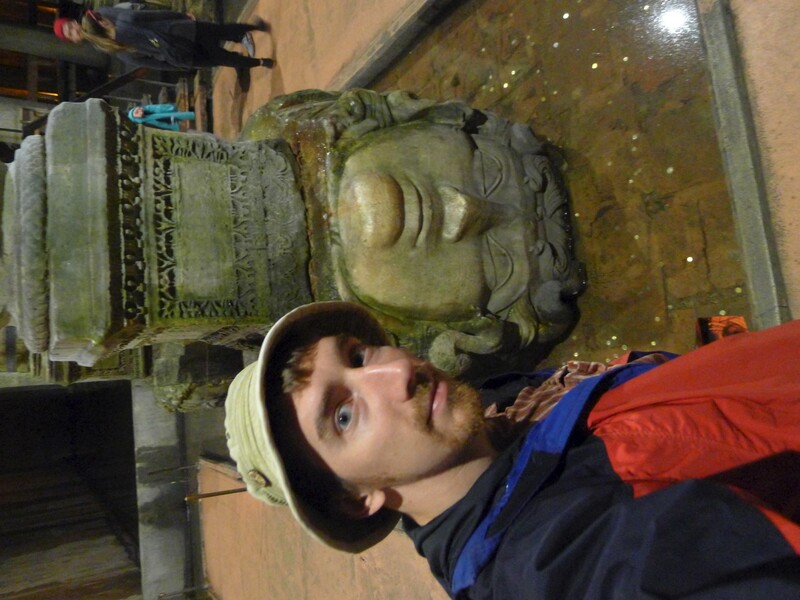 The cistern (obviously) isn’t used anymore, but they keep about 2-3 feet of water in it that you walk over on raised stone bridges. We could see some large, happy carp munching away on algae growing under the red lights. 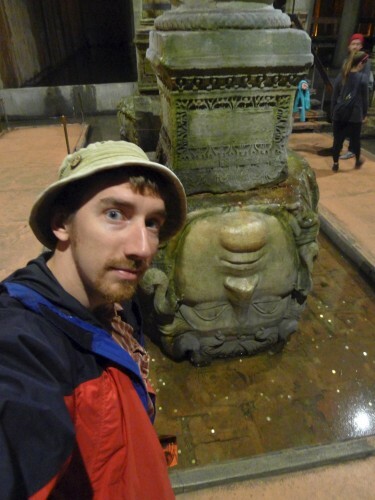 There wasn’t that much to see – it was more of an ambiance thing – but the Istanbul historical society was proud of two beautiful, well preserved Medusa heads in the far back corner of the cistern, propped sideways and upside down (in order to prevent people from looking at them from being turned to stone, of course) and being used as column foundations. That second evening, we were seeking out the “hipper” part of Istanbul so we took a ferry over to the Asian side and then waited in traffic for 45 minutes so we could get to the Moda, Katikoy neighborhood. We had some expensive beers at a British-style pub, but the true gem of the evening was finding the “Shot Bar” on the northern shore of the European side – not for their well-priced buy-10-get-three-free (and more) options, but for the live music that was playing that evening. 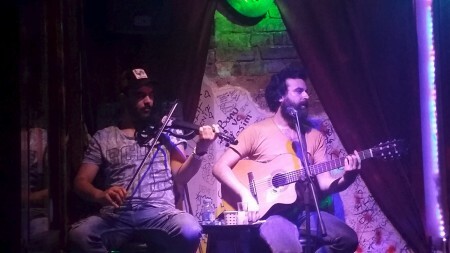 Two bearded young men – one singing and playing an acoustic guitar, and one playing an interesting-looking electric violin – were crooning Turkish folk music when we entered. We were only planning on staying for half an hour or so and walking back, but their music was so good that we ended up staying and buying drinks for two hours. The violinist in particular was particularly skilled, an expert at using the electronic modulation functions of his instrument to sound like a trumpet, a guitar, and a harp whenever he needed it. I tried to find out the name of their group so that I could get their music later, but the singer didn’t speak any English and we could communicate just enough that he pointed me to his personal Facebook page, so I can stalk him properly at my convenience. If anyone knows who these guys are, please let me know – just amazing. The following morning, Kate and I walked east (Caitlin and Branden were a bit too hung over to join us) and briefly and quickly walked through the famous Covered Market. My own stories of “turkish viagra” and the most irritating shopkeepers on the planet aside, Kate had lived in China for two years and had zero interest in tourist-trap-markets. Afterward, we found the Suleimanye mosque, which was quite large and beautiful but unfortunately closed to tourists at that time (prayer time perhaps). We walked through the cemetery, which also housed the tomb of Suleiman the Magnificent, one of the most famous Turks, and his harem. Most interesting to Kate and I though (besides the architecture and culture) were the extremely friendly and pettable cats that wandered the grounds. These cats, seen all over Istanbul, are a far, far cry from the skittish and lean Jordanian cats, and these Cami Cats were the friendliest of all. With a slight click or whistle, they would bound over to you, and climb into your lap while purring uproariously. No less than three cats followed me about after I pet them for awhile, making happy little meows and rubbing against my leg. It is said that the Prophet Mohammad loved cats so much that when one fell asleep on his lap, he cut off part of his robe that it was laying on so as not to disturb it when he left. 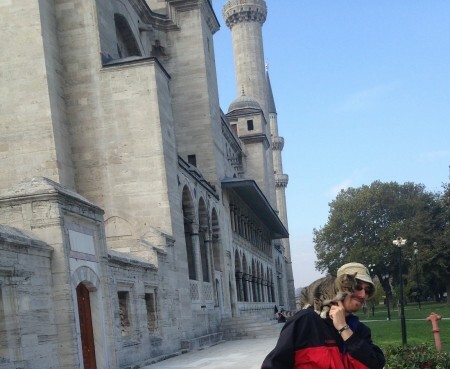 This mosque, more than any other one I’ve been to, seemed to embody that love of cats ideal. However, not all was perfect or even dry and British, hence the title. 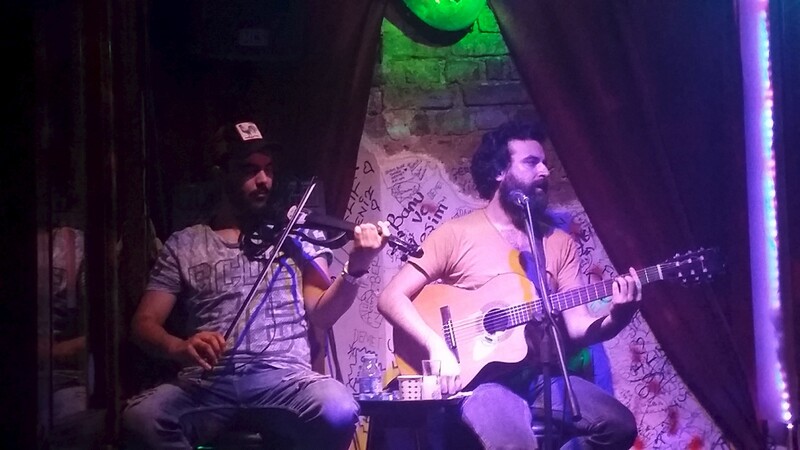 After our late live-music night, I developed a sore throat which by now, on my first day back in Amman in 3.5 years, has developed into a full on cold necessitating a battery of drugs to hopefully return me into at least a semi-passable state for bicycling on Friday. 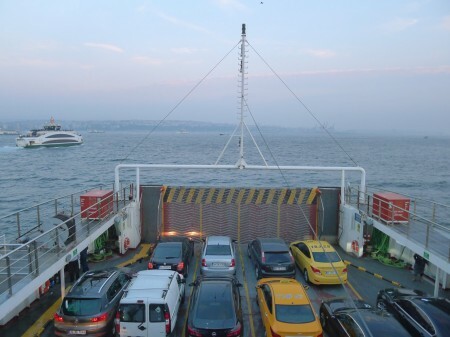 Darn it, Istanbul – why do you always have to stick your hand in my life-wallet and take something from me?! Also, here is a picture of a pet dog with a sheep tag in its ear. 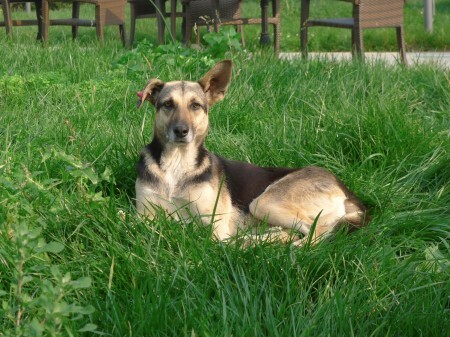 All dogs have one in Istanbul it seems. Did you ever find out more about their music?